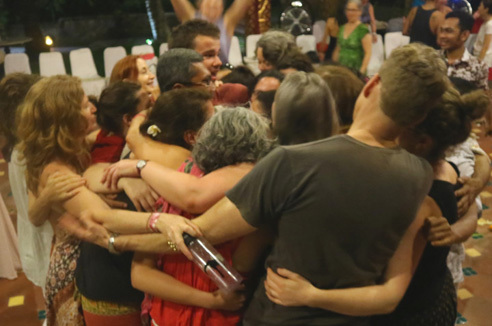 This event is a 9-day residential training designed as an "immersion experience" in Nonviolent Communication (NVC) led by a team of 5 experienced CNVC certified trainers including Dorset Campbell-Ross. Discover skills that will help you improve the quality of your relationships, deepen your inner peace, and increase your contribution in the world. Join us to be part of a compassionate community learning together how to speak from the heart; practice deep, nonjudgmental listening; and build self empowerment from the inside out. Increase connection and closeness with the people you love. Speak in a way that inspires compassion and understanding. Initiate difficult conversations with more ease and confidence. Remain centered and peaceful when receiving difficult messages. Express and receive anger fully, safely and respectfully... yet powerfully. Resolve long-standing conflicts and heal painful relationships. Parent children from the heart and move beyond power struggles into cooperation. Translate criticism, judgments and blame into life-serving messages. Shift patterns of thinking that lead to depression, guilt, and shame and perpetuate pain. Transform anger into self-understanding, thereby increasing inner peace. Enliven yourself by expressing and receiving gratitude. Learn to embody unconditional love. We intend to prioritize these three areas within the IIT curriculum and there is also room for co-creation. There will be opportunities for you to make requests for specific topics that you imagine will support you in applying NVC in these areas of your life. You will receive much more from this IIT if you are acquainted with the basics of NVC before you come. However, if you have no previous knowledge or experience of NVC, or would like a refresher course, a foundation training will be offered during the first three or four days of the IIT. Teach others a way to increase inner peace, liberate themselves and strengthen relationships. Share NVC in a way that contains/transmits it's power to transform and that inspires others. Create educational systems where students love learning and teachers love teaching. Learn to engage in effective, lasting nonviolent social change in the tradition of Gandhi and Dr. Martin Luther King, Jr.
Seminar Language: English with Indonesian translation. Accommodation and Food: variable, depending on quality desired.